I’m the one missing something! I am so sorry. I didn’t put all the ch 1 stitches in row 2. Thank you so much for pointing that out to me. I have updated the pattern now to include all the ch 1 stitches. First,thank you for these No Chain patterns! My mother showed me how to chain when I visited her in Sept and I have been teaching myself with online tutorials and trying various patterns since then. But I am seriously chain challenged. 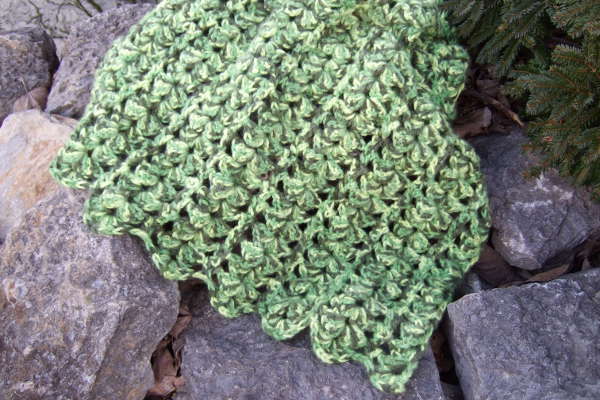 I am working on your Granny Ripple pattern now and would like to try this one next. It will be a while as I’ve given myself a few months to complete the first one in time for my neice’s wedding. A question on this pattern, how do you work a decrease in a chain space? If you’ve made decreases in regular stitches, it works exactly the same way. On the second row the decreases are worked where both parts are in the same chain space. On subsequent rows they are worked where the first part is in the chain space before the prior row dec stitch and the second part is in the chain spaces after the dec stitch. Thanks for the quick reply! I actually haven’t done a decrease at all yet but I was pretty sure I understood the instructions for it so I’m looking forward to this pattern. Row 1 says ch 3, tr in first ch, (ch 3, tr in last ch sp),in parentheses does that mean tr in ch 3 space? Yes. I’m calling these little loops chain spaces. So the first one is formed by making a tr in the first ch. The subsequent ones are formed by making the tr into the last chain space formed. I love these patterns without chains. Send more. Are we allowed to print them? You can definitely print them for your own use. You cannot print them to sell. If you print them for use of a group or class, all I ask is that the web site address of the pattern is included in the printout. I feel really silly… But I have to ask. How do I not turn? So the 2 nd row I am putting the tc into the space…with the tc or ch side up? “Row 2: Ch 4. Without turning the work, 4 dc in first ch sp…” these 4 dc are worked over the tr of the sp. The ch-3 will be at the bottom. Can a trim be put on this pattern as some of your other patterns? Yes. This has the same ch-3 loops around the sides, so any of those edgings will work. I have two questions using size H crochet hook is that going to change the number of chain spaces? And the second question I have is when it calls to to the decrease do you do the decreases in the chain 3 spaces? Using an H hook and lighter yarn will result in a smaller blanket than the measurements in the chart, so to make a particular size, use the beginning spaces of the next size up. On row 2, you will make the dec stitches in ch-3 spaces. For this row only the two parts of the dec are worked in the same space. On subsequent rows, the two parts of the dec are worked on either side of the prior row dec in the ch-1 spaces on either side of it. Thanks so much for this pattern! I just finished my first blanket using it in Lion brand homespun thick and quick in coral stripes and it looks gorgeous. I’ll definitely be making more with your pattern! Will you make a video? I don’t have a good setup for making videos at the moment, but I will add this one to my to do list. I love this pattern. I am currently using it for a scarf using11chain loops and super bulky yarn a d size ‘K’ hook. So far it looks great. Maybe after Christmas gifts are finished I can. Make a baby Afghan or lapgban. So much yarn, so many beautiful patterns, so little time. I need to clone myself! I saw this while I was looking for a pattern for my daughter. I am using an I hook, 90 loops, with Premier puzzel yarn. I may never make another C2C again. This is easy and fast thank you so much! I like the no chain pattern, but I don’t understand in row 2 why it says skip next chain sp, chain 1… Shouldn’t it say chain 1, (and then) skip next chain sp…? I completely agree. It was an awkward order. Thanks for pointing that out. I have made those modifications. Wish I would have read all the messages and comments before I tried the pattern. would have been nice to know Before I crocheted over the 53 beginning LOOPS. Oh well… that’s the fun of crocheting… it is sooo easy to rip out and do over, right? I Really Love the No-Beginning-chain patterns!! I’m sorry that is confusing. I’m open to suggestions on what would make it clearer. I have to walk the fine line between being too concise or being too verbose. If I add a lot of extra explanation then sometimes the directions are frustrating for being too wordy. Holy Hannah… There are so many beautiful stitch patterns here and I love all of them, so I’m going to download all of the PDFs and keep them in a separate folder like an e-book. Do you have a favorite charity that I could donate to in thanks for your generosity? How sweet of you. I’m just glad you like them. Thank you for no beginning chain patterns. I use the concept for everything now ,capes ,collars etc. thank you for CHARTS they are always a big help to me. On my Afghan, the first row and the sides have chain 3 or 4 loops and the last row has “jagged” points. Is that right? Yes. The beginning edge and side edges have the loops and the upper edge has the shell points. I didn’t write up an edging, but you can make shells around the other three edges over the loops. I am anxious to try this pattern for an Afghan for one of my grandchildren. I plan to use Bernat Blanket Yarn, which is pretty chunky. What size hook do you recommend? I was thinking of using a good sized hook, like a q or s. Do you think it will be too loose? I would use the hook size recommended on the yarn. I think that would recommends an L hook. I appreciate your sharing your crochet patterns over the internet. I am a self made crocheter through following all of the how-to information posted by wonderful sites such as this one.